No, this isn't Zeno of Elea. And it's not Achilles. It's Mr. Tortoise. Mr. Tortoise always wins. Zeno of Elea, (circa 490 BC – present), a pre-Socratic Greek philosopher, was the master of Paradox. To this day, most of his Parodoxes remain unproven, except to a small subset of the population who think they have all the answers. "You can never catch up." Stated for Dummies, this Parodox means that Achilles (the fleet-footed Greek war hero of Achilles Heel fame) can never catch up to the slow-poke tortoise if aforesaid tortoise has any sort of head-start, however short that head-start is. Whenever Achilles reaches a point that is somewhere the tortoise has already been, the tortoise will have, by then, advanced 'slowly but surely' past that point, so that Archilles will still have farther to go, even if it is an infinitely small one. 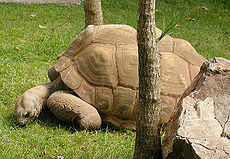 Therefore, Zeno says (and rightly), swift Achilles can never overtake the tortoise. We have all seen this paradox work in practice. Take a slow-moving child; give him a head-start; and you can never catch up. Or take a slow-moving heavy truck that's ahead of you on a road; you will never be able to pass it, even if riding on a thousand jet planes. The Mathematicians purport to prove this paradox as false, through the use of Calculus, a tool of sophistry. They say that Calculus proves that (under suitable conditions) if the distances are always decreasing, the time to catch up is finite, rather than infinite; so that Achilles will eventually catch the tortoise. This is yet another example of the tools of so-called Advanced Mathematics deceiving us. Obviously, they haven't seen or been a child nor driven a car. The United States military has incorporated Zeno's paradox into its defensive strategy. There is a now a system of radar stations equipped with ESRs (Extremely Slow Rockets) permanently on standby across the United States of America, designed to detect any missile strike against the country, and then immediately fire an ESR at the same target, ideally just in front of the offensive missile. As we know from the study of Zeno, the faster missile can never overtake the slower rocket no matter what speed it reaches, and since the Earth is also moving through space even slower than the ESR, neither munition will ever reach its target. Parts of this page were originally sporked from Wikipedia article on "Zeno's paradoxes".